Confession: I've been a lifelong packrat. books, magazines, records, tapes, videos, comics, electronic stuff . . . and junk. 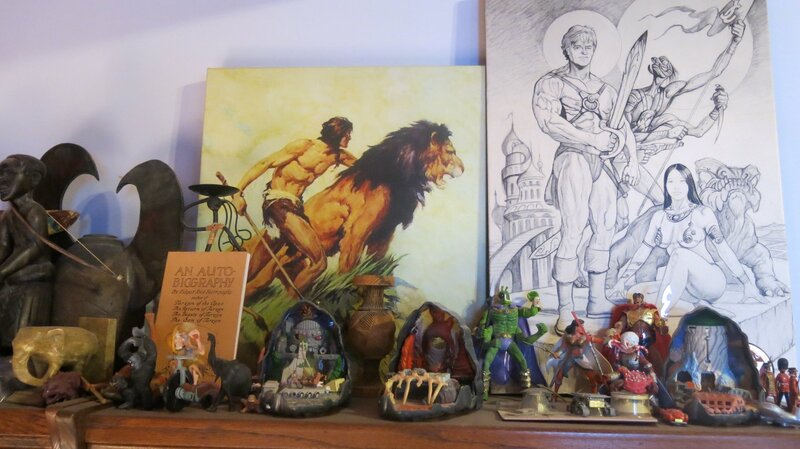 Our Edgar Rice Burroughs Collectibles. I'm sharing some photos of this memorabilia over a few ERBzine pages. FIRST: In the photo above most of the ERB collection is off camera to the sides and rear. . . but. . . 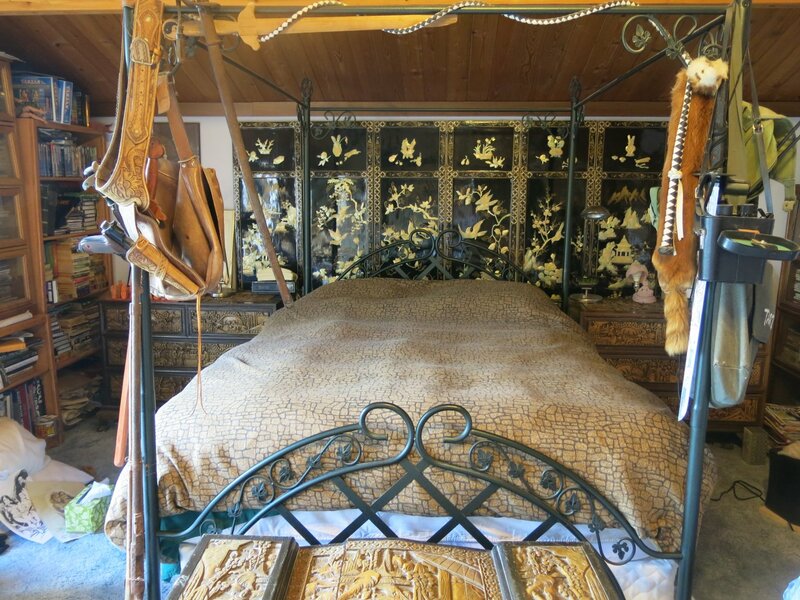 There we've hung a few treasures around the bed: Hillmans and Choys carved in oak ~ original art on the floor being prepared for framing ~ the barrel of a rusted Boer War rifle ~ gunbelt from New Mexico with a German Luger repro ~ my Dad's hunting knife ~ leather music ~ tour bag from York UK ~ two wooden karate/taichi practice swords ~ Dad's sabre that he brought back from WWII mission against the Japanese in Hong Kong ~ bull whip from Mexico ~ flying fox hide from Taiwan ~ Japanese Ceremonial sword ~ Dad's WWII field glasses ~ WWII RCAF tote bag ~ two Disney Tarzan backpacks ~ arrows in a quiver ~ Wushu martial arts T-stick ~ hand-carved chest from China . . . now, on to the ERB stuff . . .
overlook our books and this shelf of Barsoomian and Jungle toys. 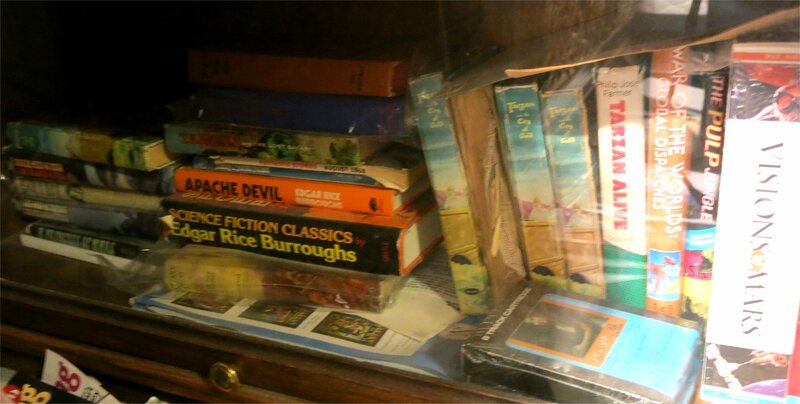 Books penned by Edgar Rice Burroughs in roughly chronological order. to provide fodder for our weekly and monthly Webzines and Website updates. Sadly I've never been able to afford many first editions -- or even repro dust jackets to showcase the books. Some of these treasures may appear a bit ratty but they are well read and well loved. 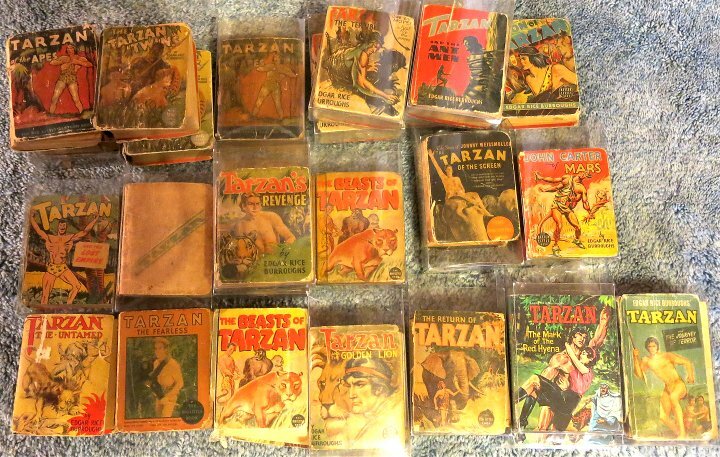 I purchased my first ERB books in the early '50s and they have all survived to this day. how the editions found their way to these shelves are almost as entertaining . . .
. . . every cover tells a story. Last shelf for now. . . there are many more "second stringers" elsewhere. Great for reading on the road. . .
. . . the iPad allows these guys to stay home a lot more now. Tarzan the Terrible with the JCB flip motion found me in the late 1940s. . .
hooked on BLBs ever since. I have all Mad mags up until they turned to colour and advertising. The early Mad comics featured some great Tarzan and pulp hero parodies.